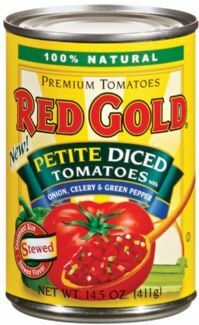 My friends at Red Gold Tomatoes recently sent me two cans of their Petite Diced Tomatoes flavored with Onion, Celery, and Green Peppers so I could share an easy weeknight dinner recipe with you. I decided to use the tomatoes to play a game of what I like to call Chopped: Home Edition, my personal spin on my favorite Food Network show. That’s where I create a dinner using only the ingredients I have on hand in my kitchen. It was hot, my sprained ankle was sore after work, and I was tired. Bottom line: I just didn’t feel like stopping at the store on my way home to pick anything up. Instead, I looked at what was in the pantry and fridge that would pair well with the tomatoes. I created my breakfast-for-dinner Kitchen Sink Frittata using eggs, potatoes, onion, flat-leaf parsley, prosciutto, and cheese that I had on hand. After it came out of the oven, I topped it with a mixture of the petite diced tomatoes, a bit of my favorite marinara sauce, and some grated parmesan. It was a complete meal in one skillet! I love frittatas, because they’re so much easier to make than an omelet…to me at least. There’s no stressing out over trying to perfectly fold it…simply sauté your ingredients, pour the egg custard over the top, and pop it into the oven. That gives you a pocket of time to whip up a nice side dish, then all you do is cut into wedges and serve! For this frittata, I served a combination of berries topped with a mixture of strawberry Greek yogurt and strawberry preserves and a sprinkle of granola. It was a simple and healthy dinner that I had ready in just over 30 minutes start to finish. Step 1: Preheat oven to 375. Add 1 tbs. olive oil to an oven-safe non-stick skillet over med-high heat. When the skillet is hot, add 2 peeled red potatoes that have been cut into a ¼-inch dice, along with salt and pepper to taste. Cook, stirring every few minutes, until the potatoes start to brown – about 10 minutes. Add half of a small yellow onion that's been diced, and 3 pieces of prosciutto (or other thin-sliced ham) that's been cut into bite-sized pieces. Give it a stir and cover to steam the onion and potato. Cook for about 5 minutes, then uncover and give the mixture one stir. By now, the potatoes should be nearly cooked and the onion golden-brown. Step 2: Make the egg custard by adding the following ingredients to a large measuring cup: 5 eggs (I use Eggland’s Best), 1/3 cup skim milk, ½ cup grated parmesan, 2 tbs. chopped flat-leaf parsley, and salt & pepper to taste. Whisk well to combine, then evenly pour the egg mixture over the ingredients in the skillet. Sprinkle with ½ cup diced or shredded 2% cheese of your choice; I used a combo of 2% cheddar and jack chunks. Step 3: Place the skillet in the oven and cook until it begins to puff and turn golden, about 10 minutes. I like to turn the skillet around in the oven halfway through baking to make sure it cooks evenly. While the frittata is baking, add the following ingredients to a saucepan over medium heat: 1 can well-drained Red Gold Petite Diced Tomatoes with Onion, Celery, and Green Pepper, 1 cup jarred thick marinara sauce, and 1/3 cup grated parmesan. Stir to combine and heat until bubbly. When the frittata comes out of the oven, use a slotted spoon to carefully place the tomato mixture in the center of the frittata in a circle. To serve, cut the frittata into wedges. For something that was created using bits and pieces that I had in my kitchen, this frittata was outstanding! The freshness of the Red Gold Tomatoes worked really nicely with the smoky prosciutto and earthy potatoes. Michael asked for seconds…and thirds...of this, so you know it’s a keeper. This basic formula can be used to create an infinite variety of frittatas…just use whatever veggies, meat and/or cheese you have on hand on a given day. I served this frittata with a berry-yogurt parfaits, but biscuits or toasted English muffins would be great too. I always have a can or two of Red Gold Tomatoes in my cupboard, because they allow me to whip up tasty weeknight dinners like this in a matter of minutes. Disclosure: Red Gold sent me two cans of their Petite Diced Tomatoes to facilitate this post. However, the opinions expressed are my own.